WHITNEY POINT (WSKG) — About 15 dairy farmers talked with Southern Tier Congresswoman Claudia Tenney at a farm in Whitney Point for two hours Thursday afternoon about changes they want to see in the industry to start turning a profit again. Cub Frisbie heads up the Tioga County Farm Bureau. 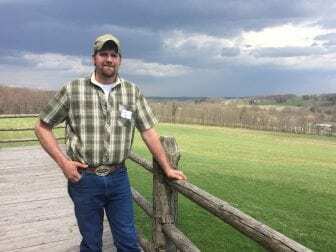 He used to be a dairy farmer, but sold his cows a few years ago to grow corn and soybeans instead. “Ugly. 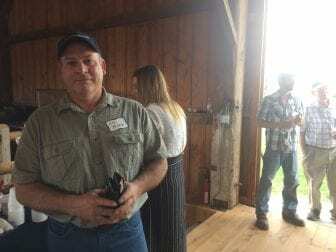 It’s ugly right now,” said Cub Frisbie, head of the Tioga County Farm Bureau. That federal cost of milk is volatile, he said, no one knows what it will be in a year, let alone month to month. Right now it’s about $14.44 per hundred pounds of milk. Back in 2014, it hit $27, then dropped to about $18 in a matter of months. Jeff Doty leans against the porch rail at Whittaker Farms in Whitney Point, NY. He runs a 70 cow dairy farm in Willet. Some folks have told Frisbie dairy farmers should just get out of the industry. That’s a non-starter for Jeff Doty. It’s part of his family identity. His grandfather and father were dairy farmers. Doty has a one-year old daughter and hopes she and his future children would carry it on. As for possible solutions, most agreed, the best thing to do to support dairy farmers is to buy whole milk because farmers earn more money than they do for skim milk or cheeses or powdered milk. Because of that, they say a big help would be for New York schools to offer whole milk in the cafeteria. Plus, advertising: milk commercials like “Got Milk” have “dried up,” Doty said. He thinks billboards and ads would help boost demand, which has been decreasing. Another possibility is a supply management system for pricing milk like Canada’s, but, it’s a completely different system and some dairy farmers say that’s hard to swallow for Americans who like competitive markets.